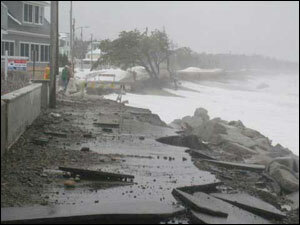 NERACOOS has worked with meteorologists at the National Weather Service in Gray, Maine to prototype a decision-support tool for NERACOOS that predicts coastal storm damage. 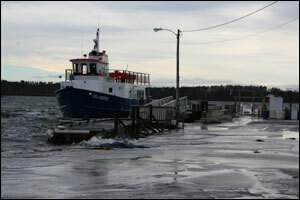 The tool uses forecasts of water level and waves to predict coastal damage near Saco, Maine. 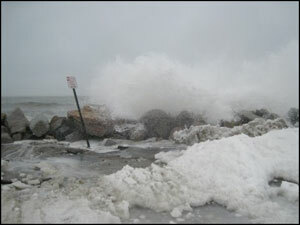 A prototype was recently adapted to Scituate, Massachusetts and is being validated with storm data from the weather service and local emergency management community. An empirical relationship exists between storm tide, waves and coastal flooding or splash-over damage which allow us to predict when flooding and splash-over events (such as beach erosion) might occur based on forecast water level (tide height) and wave height data. The red line (horizontal) represents the point at which the water level is at flood stage (FS). A yellow line (slight diagonal left to right) represents when splash over begins. Progressively darkening horizontal bands (light orange to red), represents when minor, moderate and severe coastal flooding will occur. When the nomgram is in motion, a real-time indicator moves through the 48 hour forecast as a series of red circles. The leading circle of the indicator represents the most recent reading, and the trailing circles are previous readings (in 1 hour increments). While not a forecast to be a significant event, this storm showed the value of the forecast tool for predicting coastal flooding.